Meeting in Caribou Thursday, Dec. 14, Board members adopted the plan, developed by Jim Haguewood of One Group Consulting and Sheila Jans of CultureWorth. In early 2017, the NMDC Executive and Board leadership recognized that the organization needed to assess its performance and recalibrate its strategic priorities and direction. The result is the NMDC Next Generation Strategic Plan 2018-2022, an organizational strategy developed with broad public, private, and non-profit sector input, staff and board perspectives, as well as critical analysis and application of proven rural community economic development principles. Community — Which addresses community services, quality of place, arts and culture and destination development. Finance — Access to capital, impact investing, mission driven lending, technical support and entrepreneurship. Partnerships — Alliances with customers, organizations, agencies and communities. Communications — Audience appropriate messaging and collaboration. Organization — Programming, operation and structure and professional development. The Strategic Roadmap is a five-year guide for NMDC to set priorities, formulate yearly work plans, and evaluate performance over the plan’s term. “The key premise of the Next Generation Strategic Plan is to generate ‘greater impact’ in the communities and economy through the deployment of NMDC’s resources, being predictive of the future, being innovative with an entrepreneurial mindset and integrating an open systems planning model,” said NMDC Executive Director Robert Clark. The complete strategic plan can be found at www.nmdc.org. In addition to adopting the strategic plan, Dennis Marker, City Manager of Caribou; Aubrie Michaud, Town Manager of St. Agatha; and Melissa Devoe, Selectperson for Limestone, were appointed to the Executive Board. Two new members of the Loan Review Committee were also appointed. Kevin Pelletier of K-Pel in Fort Fairfield filled a vacant spot and Keith Brown of the NMDC Executive Board was also approved. The Executive Board meets again Thursday, Jan. 11 at 12:30 at the NMDC Boardroom in Caribou. Pictured above: Jim Haguewood of One Group briefs the NMDC Executive Board on the highlights of the newly adopted NMDC Next Generation Strategic Plan. Click here to view the NMDC electronic Christmas Card. Pictured are Laurie Pelletier, daughter Lanie Pelletier and Edgar Pelletier. FORT KENT — If you live and or work in the greater Fort Kent area you might notice a distinct difference on some of the garbage trucks driving around. That’s because Edgar and Laurie Pelletier of Fort Kent just purchased the longstanding business, Saucier’s Sanitation LLC, from Kenneth Saucier of Fort Kent. Saucier’s Sanitation LLC serves about 1,000 residential and commercial customers in the greater Fort Kent area. The business has been around for well over 45 years and is one of the two major sanitation businesses in the area. The father and son duo of Saucier’s Sanitation have passed the business onto Edgar Pelletier, a long-time mill worker at Twin River’s paper mill and Edgar’s wife, Laurie, a family visitor and lactation counselor at Fish River Rural Health. 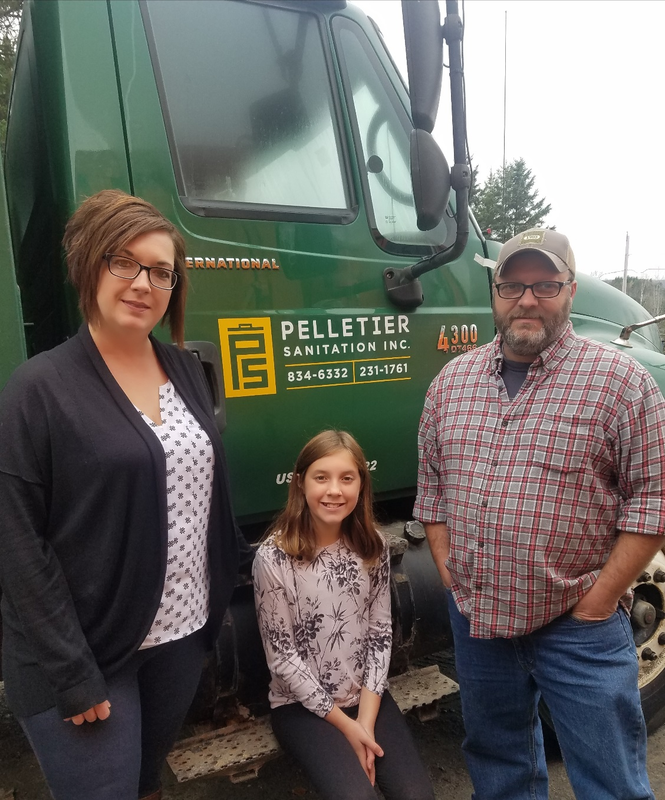 Pelletier plans to keep his employment with the mill as well as help to manage the overall operation while his wife will be handling most of the daily office duties. Both of Saucier’s current employees plan to stay with the company through its transition. The business will now be known as Pelletier Sanitation Inc. and its physical location is currently being constructed at 551 Violette Settlement Road in Fort Kent. Pelletier Sanitation Inc. offers commercial and residential services, dumpster, trailer and roll off rentals and metal and card board recycling. Inquiries about service can be made by phone at (207) 834-6332, or by email at pelletiersanitation@gmail.com, or visit the company Facebook page. When trying to decide where to start with the entire process of starting a business, Pelletier was referred to Josh Nadeau of the Maine SBDC at Northern Maine Development Commission. For more information about free small business advising and small business loans, contact Nadeau of NMDC at 498-5765 or by email at jnadeau@nmdc.org. FORT FAIRFIELD — The new year will usher in more producer and would be producer business training workshops by Northern Maine Development Commission and the United States Department of Agriculture’s Farm Service Agency. The workshop, Thursday, Jan. 11 at the Fort Fairfield Town Office from 12:30 p.m. to 3 p.m., will focus on Cash Flow. Cash Flow is the life-blood of all businesses, particularly start-ups and small enterprises. As a result, it is essential that producers can forecast what is going to happen to cash flow to make sure the business has enough to survive. This free workshop will explore the importance of developing an effective and useful "Cash Flow Analysis" for your farm operation. FSA officials will also be on hand to explain federal programs and services designed to help producers learn about, and gain access to, FSA's popular Farm Operating Loan Programs. This is the third of five different business training workshops for producers and would be producers. Others are scheduled for Caribou Feb. 13 and the St. John Valley March 22. Attendance at prior workshops is not neccessary to benefit from this session. Earlier this year the USDA announced cooperative agreements with partners to educate producers, including those who have been historically underserved by USDA programs, about FSA programs that provide financial, disaster or technical support. Under a cooperative agreement with FSA, NMDC received funding to provide educational services to agricultural producers in Aroostook County. The number of Maine farmers aged 34 and younger grew by almost 40 percent in the five years from 2007 to 2012, the last time the USDA did a comprehensive agriculture census. That growth surge — from 396 to 551 young farmers — far surpassed the 1.5 percent increase in the numbers of young farmers in the United States. Ouellette encourages producers to attend, but says the information is also valuable to anyone who wishes to better their business skills. Pre-registration is required at www.nmdc.org. For more information, contact Ouellette at 551-5837, or by email at aouellette@nmdc.org. Northern Maine Development Commission (NMDC) has developed a training program to assist communities with the capacity to achieve successful community and economic development projects. The 5-Session training program will begin with a kick-off later this winter. The purpose of the opening session is to introduce participants to the training program that NMDC has developed as a way of passing on the skills, knowledge, and resources available so that communities will be able to complete local projects in an efficient and organized manner. For more information contact Joella Theriault. AROOSTOOK COUNTY — Businesses in Aroostook County now have another tool to grow their sales. The federal government recently announced a change in the Small Business Administration’s (SBA) Historically Underutilized Business Zone (HUBZone) program, which should benefit northern Maine. The Historically Underutilized Business Zones program was enacted into law as part of the Small Business Reauthorization Act of 1997. The program encourages economic development in historically underutilized business zones through the establishment of preferences. Those preferences to HUBZone qualified companies include competitive and sole source contracting, 10 percent price evaluation preference in full and open contract competitions, as well as subcontracting opportunities and the federal government has a goal of awarding three percent of all dollars for federal prime contracts to HUBZone-certified small businesses. For more information on HUBZone certification and government contracting contact Northern Maine Development Commission’s Dana Delano at 521-1713, or by email at ddelano@nmdc.org.